Must guard their minds in perfect self-possession. No discipline can ever be maintained. Will bring us down to pains of deepest hell. Could bring upon us such calamities. Every virtue drop into our hands. All these things are likewise bound. All these things are likewise tamed. Primordial mind is pure, yet vestigial imprints (vasana) and neurotic tendencies accumulate by those actions that are rooted in a fundamental distortion. This distortion arises out of the imaginary inner domain and the blindness which acts from attachment, aversion and delusion. These three primary afflictions of the body-mind complex further engender fifty-one secondary afflictions. (See Overcoming Negative Afflictions and Building Positive States). It is through Calm-Abiding meditation, which focuses the mind so single-pointedly, that gradual and deepening disclosure and unpacking of these knots of obstruction occur. No spiritual path can be traveled without this deepening one-pointedness. Buddhism is concerned with true happiness not a chimera of happiness, for in Buddhist practice, Calm-Abiding results in this higher insight (vipasyana) to absolute Happiness. Those who wish to travel the path to Great Awakening and to attain to realization must be able to do those meditation practices that will lead to Higher Insight, Higher Consciousness and the capacity to be of true and lasting benefit to others. To do so, one's own capacity to be effective hinges on the state of one's own mind. Untamed, this state of mind is of no benefit to one's own suffering nor can be of benefit to relieve the suffering of others. Practice Calm-abiding sitting comfortably, with the spine straight, the legs crossed or, sitting up-right in a chair. The right hand rests lightly on the left palm and the neck slightly bent. The eyes have a soft focus down the bridge of the nose. The tongue held lightly against the upper palate. In the Dharma Fellowship the object of concentration is the breath and the point four fingers below the navel. The gentle inhalation-exhalation and expansion caused by the diaphragmatic breath is attentively observed. (See Yogacara Theory). Traditionally, the nine stages are described as consisting of the Six Powers, Nine Levels, and the Four Engagements. The six powers are activated by what is termed a definite-emergence from the allures of worldliness (Gr: metanoia, Skt: udvega, Tib: skyo ba). Each of six powers is progressively strengthened. Through the persistent action of remembrance, which is to remember the object of concentration often, as a mother constantly remembers her child. The second contributory action is alertness, where one part of the mind watches the mind concentrate, as a mother watches her children. One simile that indicates the dynamic tension of the meditator's awareness not being too lax (laya) nor to excitable (styana) is that of the Brahmin's thread. A Brahmin's thread is twisted from raw cotton. If the tension in pulling and twisting the thread is not just right, then the result is either the thread bunching up or doesn't move at all, or just breaking off. Just so adjusting the mind's watchfulness is like the making of the Brahmin's thread. Pictured are the Nine Deepening Stages of Calm-Abiding. Through the process of perfecting Calm-Abiding, starting with cultivating virtuous actions, we diligently study and ponder the Dharma. We recollect upon the nature of mind, the very wish-fulfilling gem. Our practice begins with the state of mental agitation that is the conventional mind-stream. Through instruction in Calm-Abiding we bring the mind to stabilize on its object of concentration. 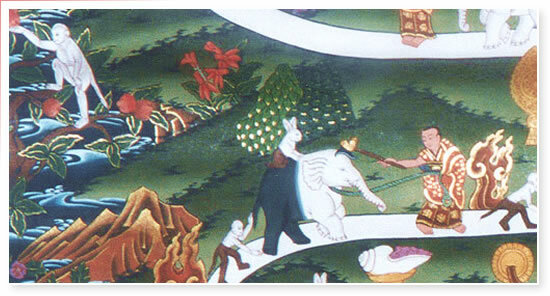 As pictured here, the monk progressively chases, binds, leads, and subdues the elephant-like mind (whose color progresses from black to white). At the end of the path a single-pointed concentration is attained, and the 'purified elephant' of the mind is now completely settled. 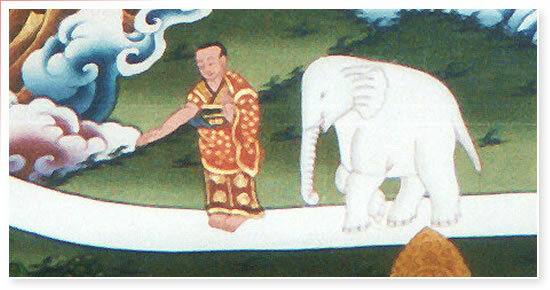 The flying monk represents bodily bliss; and his riding of the elephant, mental bliss. 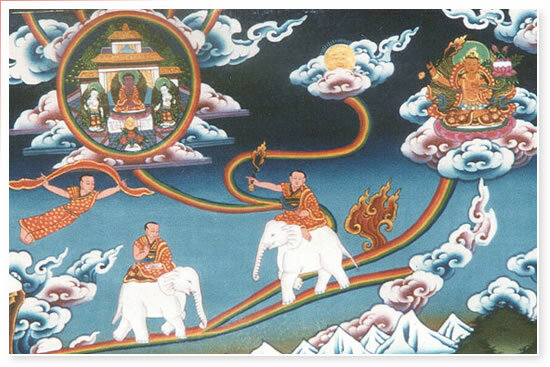 Riding the elephant back triumphantly across the rainbow, wielding the flaming sword of perfect insight having attained the flame of clear understanding and remembrance, represents the uprooting of samsara by the unity of Calm-Abiding and Higher Insight. Levels One and Two, the meditator starts by using the powers of listening and pondering the meaning of the Dharma and this fires-up the motivation and zeal to stay with the concentration on the breath, the object of meditative concentration. Level Three and Four, the power of continuous non-discursive recollection of the understanding of the dharma gained by studying and the deeply pondering of it, brings about a capacity for periodic engagement of concentration. Level Five and Six, through the power of Watchfulness or Alertness, although our engagement is still periodic, wavering is diminishing. This power indicates that the meditator firmly and clearly comprehends what is occurring and what he or she is doing. Level Seven and Eight, the power of Diligence or Effort, the mind is Concentrated and pliant of both body and mind, and the meditator's engagement in concentration is uninterrupted. Level Nine, with the power of complete adaptation/habituation full Calm-Abiding is attained, the mind is naturally settled. If an elephant is wild, it is very dangerous to all other animals. Likewise, if the mind is not tamed it harms others. All suffering is caused by the untamed mind. An elephant once tamed obeys its master better than any other animal; even if the master were to say pick up a very large hot ball with its trunk, the elephant will do so. Therefore, the mind when tamed, can perform any action, no matter how difficult. The footprint of the elephant is larger than any other animal's. Likewise, if our mind is tamed and comes into the realm of the Dharma, it serves its master better than any other and its capacity and scope is unlimited. If our mind is very peaceful and well tamed, there will no longer be any enemies of that person anywhere. If our mind is peaceful, we make all others around us peaceful. All the results of our mind-whether good or bad-increase, for body and speech of a person are only servants of the mind. The monk in the drawing is the meditator. The dark color of the elephant signifies the presence of weakness and fogginess, because these two are "the darkness of the mind." The monkey's dark color symbolizes scattering of attention; its presence symbolizes distraction and scattering of focus from both inner turbulence and outer attraction. Thus the monkey leads the elephant everywhere, always to different objects. (Just as scattering distracts the mind to sense objects). The rope held by the monk symbolizes recollectedness; and the hook symbolizes watchfulness or alertness not only to the instruction about the practice of Calm-Abiding but also to the enlarging of the undistracted field of Awareness: what is occurring and what one is doing. The fire is the energy and zest for meditation. The progressively diminishing flame, along the path, is lessening of effort needed to cultivate understanding and recollected concentration. Cloth (touch), fruit (taste), perfume conch (smell), cymbals (hearing), and a mirror (seeing) are the distractions of the five senses and their objects because in the early stages of cultivating meditation, the attention is readily distracted by objects of the senses. The rabbit represents a more subtle aspect of scattering and fogginess, which dilutes the zest for practice and diminishes the mind's clarity. The Nine elephants show progression on the Path to Calm-abiding. Effort of Guarding: being keen and alert to interferences from the outside and to all situations and actions that counter the acquiring of the virtues of Calm-Abiding. Effort of Aspiration: cheerfully and diligently working in such way that despondency or a self-defeating depression are in check and eradicated. Effort of Engagement: the application of energy and positive emotion that is balanced and consistent. Effort of Attainment: not settling for a half-hearted attempt, but full attainment because of the aspiration to end one's own suffering and that of others. Power of Aspiration: having pondered the Dharma and taken the meaning to heart, a genuine aspiration to obtain the ability and virtues of Calm-Abiding arises. This aspiration is rooted in the contemplation of the preciousness of the human existence; that to have come to the Teachings of the Enlightened One's is precious and hard to obtain; that death, impermanence, action and result are deeply understood; that the ways of the world of samsara are conditioned by the acts of non-virtue from the flowering of seeds of grasping at self and 'things' being existent. Power of Firmness: stick-to-itiveness, steadfast, firm and resolved. Confident in the Four Noble Truths as well as the dedication to be of help to others. Also firmly grounded in the knowledge of the consequences of unwholesome action. Power of Joy: having found that path which will bring ourselves and others to the profound, unchanging, uncreate, permanent happiness, we are able to face the problems of self-transformation that inevitably arise: physical, mental, and emotional with the delight of certainty in the Dharma. Power of Moderation: we know when to rest. If we are weak and exhausted in energy, we need to recharge, relax and let go for a time so we may continue with a new zest and vigor. Now, to be able to practice this meditation successfully, it is necessary to have an understanding and certain familiarity of what is called the Six Faults and the Eight Antidotes. In the following diagram, we list the six faults, and beside each fault we show the appropriate antidote. The meditator should review this list and gradually come to understand what it means. In order to attain Calm-abiding, the six faults must be abandoned. This is not something that one can do all at once. Sitting in meditation, one must apply discipline to keep the mind fixed on its object (ālambana). In trying to do this, laziness will naturally arise. How do we overcome this laziness, this desire to give up and quit the practice? We must learn to counter it with four different practices. First, we need to have Confidence in the value of meditation. That is, we need to be inspired, and truly believe in the Spiritual Path that we are following. Second, we need to have a sense of discipline, a sense of Intentional Austerity. It is normal always to follow the path of pleasure, the path of least resistance. But here, we have to consciously think as follows: "I am going to subject myself intentionally to an act of Austerity." This is my tapas, my austerity, namely that I will apply myself to concentration, without allowing the mind to waver from its object. Third, we must make conscious exertion. Mechanical effort won't help here. One has to make exertion very consciously and deliberately. Austerity is patience in the face of hardship or pain. Exertion, on the other hand, is energy put out to attain a goal. To focus the concentration a tremendous amount of exertion has to be applied. And fourth, one must attain inner Serenity. Prasrabdhi has been translated in different ways by different people. Tsepak Rigzin says it means pliancy, suppleness or lightness of mind and body. Henepola Gunaratna refers to it as tranquility. It is all of these things. Prasrabdhi is when the mind seems to enter naturally into the "flow." When, after trying to concentrate, there comes a sense of naturally being able to do so. This arises with time. If one can get to a level where concentration continues with relative ease, then this will combat our tendency to laziness. When one forgets to keep the attention on the "object" (i.e., the rise and fall of the breath), then it is important to apply the antidote of remembrance. Just as one "remembers" in one's head the list of items in a shopping list, so one has to keep remembering the object. There is a part of the mind which is always recording, always taking everything down in memory. Resort to that part of the mind, and keep focused on the object. Remember to concentrate upon the object. Remain "mindful" or "well-recollected" of the practice that one is trying to do. Very quickly, the meditator begins to find that, while concentrating upon the rise and fall of the breath, one enters into one of two mental states. Either the meditator gets very dreamy and "spaced-out", in a daze, or the opposite, she or he gets lots of thoughts and images. If one is getting dreamy and spaced-out, even though not losing count of the breath, we say that there is a state of passivity. If, on the other hand, all sorts of thoughts and images start arising, we call this a state of excitation. Every meditator swings back from one state to the other. One should note how big are the swings between passivity and excitation. Note when one slips into the passive state, and when one is aroused by the excitable state. On a larger scale, these two states are what we know as depression and mania. The manic-depressive is someone for whom the swing between these two poles is extreme. But on a smaller scale, all human minds experience this polarity-there are times when we are spaced out, mildly depressed; other times, when we are excited, enthusiastic and bubbling with energy. In meditation the swing between these two poles has to be gradually calmed down, until the mid-point between both states is reached. This is extremely important and yet, strangely enough, very few schools of meditation even mention this issue. The antidote for excitation and passivity is introspection. This means to observe what is going on. To be aware. Continue the concentration, and while doing so, check what state of mind one is in. Now, if you check yourself, this is what is called application. You apply a little bit of will. For example, if you note that you are in an excitable state, then you will naturally attempt to calm down. If on the other hand you are almost falling asleep and seem to be in too calm a state, you will supply a little more concentration. Putting a little more exertion into the practice is like adding energy. Either attempting to calm down, or applying more exertion-which ever is needed-is called application. If there is too much application, this will disturb the equilibrium of the practice. To go into deep meditation one must have a clear, conscious mind that is not too excitable. One must become extremely calm and relaxed, yet not dull, dazed, or "spaced-out." Trying to find this balance is application. But too much application is not good either. Therefore, when too much application disturbs the serenity of the meditation, one has to apply the antidote known as impartiality. By observing all of this, an individual can make actual progress in meditation. If they are just "doing the given exercise" but do not understand these subtle fluctuations in practice, there will be no real progress. One can't just sit with a blank mind, trying to concentrate and not be aware what is going on and what one should be doing simultaneously. One must become truly knowledgeable about how meditation works and know what you are doing! Using the eight Antidotes, one removes the defects of depressive passivity and manic excitation. With the four types of attention one is enabled to attain the nine Stages of Calm-abiding. One likewise becomes aware of the manner in which one attends to the object. The first is called Forceful Attention because it takes a lot of force or will-power to attain the first two Stages of Calm-abiding. Then one must switch to an attention that carefully watches the back and forth swing of excitation and passivity that dominates the mind. This is called Disturbed Attention, because one is attentive to the disturbance caused by excitation and passivity. Disturbed Attention carries one through the third to the seventh Stage of Calm-abiding. The third Attention is called Immovable Attention. It is so called because now the meditator has transcended the bipolar swing of excitation and passivity. This Attention arises at the eighth Stage of Calm-abiding. The fourth Attention is called Spontaneous. It is a form of concentration imbued with awareness that is just naturally present all the time. This is an innate or natural self-abiding state of the ground of the mind in and of itself. It shines forth automatically in the attainment of the ninth Stage of Calm-abiding. Then one passes into Samadhi. The first stage is attained through study and listening to the Dharma as well as understanding the nature of cyclic existence. It is essential that the seeker come to realize the importance of the First Noble Truth taught by the Buddha. This is the Truth of Suffering, and the reality of this Truth as a fact of life, has first to be intellectually comprehended and then further appreciated as a result of successful contemplation. Through an emotional intuition gleaned from this pondering one must thoroughly and deeply connect with this Truth. Likewise, one grows in an understanding of the Origin of Suffering, which is to see why suffering exists in this world and the actions that propel further disquietude, not only overt forms of suffering, such as emotional-mental pain, but the other two kinds of suffering, the suffering of change and the suffering of conditioned reflex action which creates more of the same. Therefore one comprehends suffering in all the ways that it impacts human life. So motivated, there is then a steady drive and intent to end this vicious cycle of suffering. When such an emotion arises, the seeker of Truth experiences a genuine revulsion for all worldly things. So then, with this turning-about experience, we begin to see and feel the need to steadfastly focus and engage our mind in meditation. To do this we start by concentrating on the rise and fall of the breath at the abdomen. 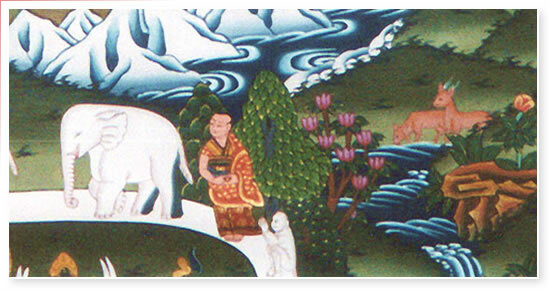 In the illustration the monk, the meditator, chases after the elephant, the wildly untamed mind. In the first stage our mind is completely under the sway and allure of the five sense objects and mental-emotional events. The rope and the hook carried by the monk are hardly any help at this point. When the object is not steady, disturbances are plentiful. 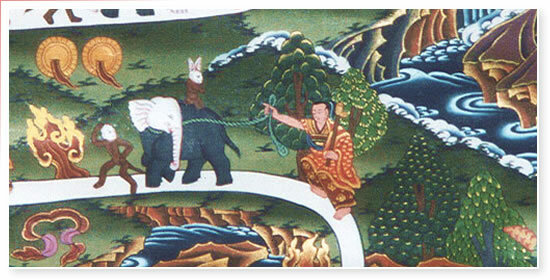 The "elephant" is not even looking toward the rope and hook and the monkey runs wildly, leading the elephant. At this first stage, the flame of the fire of effort must be very strong. The monk fixes his mind on the breath. Hope of success commences here. (The monk holds up his hands.) The rope and hook are needed to bind and tie the elephant. One must use remembrance and watchfulness to bring the object of meditation close. The hook makes it possible to drive the elephant in the right direction. The white spot on the heads of the elephant and monkey indicate that the mind begins to become a bit calmer, with progress in staying and resting the mind on the breath, fogginess and weakness lessen slightly. However the five senses still distract: touch (cloth), taste (fruit), smell (perfumed conch), sound (cymbals), and sight (mirror). 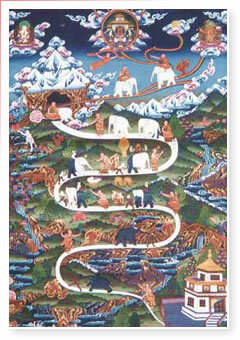 This second stage is attained through the power of and motivation from pondering the Dharma. This contemplation forges concentration on the anvil of a certain faith and lengthened periods of concentration. The rope represents the power of recollection (smrti). This power comes from the "memory" nature of mind. Remembrance is like the rope, which is now on the elephant's neck and you see in the picture that in response the elephant gazes toward the monk, the meditator. Now the rabbit makes its appearance. The meditator can distinguish the subtler forms of distraction and weakness. The rabbit represents the presence in the mind of passivity. Here, especially, the meditator seems to enjoy the state of "spacing out." She or he thinks that they have attained an ideal calm. Everything feels good. In fact, this is really a distraction, a subtle daze. The knowledgeable meditator knows that there are two levels of "passivity": a basic form of 'spacing-out,' which seems very pleasant but is obviously a distraction, and a far subtler form, which seems a very peaceful state of mind, but which is really a disguised form of depression. This must be watched for by careful introspection. Like a rabbit using camouflages well, this stage can be is mistaken for progress, and since this subtle weakness does not disturb concentration, it relaxes the meditator, and seems pleasurable. Yet it is a disturbance nevertheless. For later it will make our mind weak; and suppress desire to be energized with sufficient effort. Like a slow leak in a punctured balloon, this subtle weakness makes the mind weaker and weaker, very slowly. At this stage, the dark and white colors are almost half and half, showing that distraction and fogginess have diminished by half. With the power of watchfulness and alertness the meditator firmly understands what is being done and what is occurring. The rope on the elephant's neck is loose, because the mind is quite obedient. The elephant, monkey, and rabbit look back; showing that having recognized these mental distractions, the mind turns back to the object of contemplation. At this point concentration on the breath is possible for about fifteen minutes. Through immersion in power of watchfulness, distraction and fogginess are almost completely gone and the monkey is now behind the elephant; now the mind is not under the leadership of scattering distractions. The rope of remembrance is not so necessary now, but since subtle distractions grow stronger, the power of diligence/perseverance must be applied. The long effort against the invasive distraction of the five senses and any inner events may too quickly relax the effort of the meditator, and the subtler forms of distraction would wax stronger and thereby the intensity of clarity diminishes. Pictured as another monkey eating from a tree on the periphery, and not on the path, means that while one is developing Calm-Abiding, no other thoughts, even those of Dharma or meditations on Samsara etc., can be allowed to interfere with concentration! One experiences steady concentration for a half an hour, and the breath-object is very "close" to the mind; the mind is peaceful with no distractions. The allure of the five senses are now gone. Gone also are the other distractions of the inner emotional and mental events. An energetic concentration arises, shown as no hook and rope needed, though ever at the ready. The monk is not even looking at the elephant. Concentration without any disturbance is possible for at least one hour. The monk hooks the elephant with his goad; the mind is stopped from wandering by clear understanding. After long persevering practice, the meditator reaches complete pacification of the mind. The monk is behind the elephant and allows the mind to 'rest' naturally. It concentrates on its own. The hare disappears and, because no energy is needed; concentration comes immediately. But still, the monk observes! There still remains subtle weakness and distraction, but (because they totally lack dark color) there is no disturbance at all. Concentration is possible for about four hours. We see that the monkey leaves the elephant and now squats behind the monk in complete obeisance. However there are still slight traces of black; this shows that even the subtlest sinking and scattering may continue to arise. Should they begin to arise they can be eliminated with slight effort. Spontaneous concentration is now present until the meditator wishes to stop it. As the concentration progresses, so does the clarity of the object concentrated upon. Ones sense-media are not needed and do not intrude. The monk doesn't even need to look at the elephant; the elephant just comes and obeys. Concentration for one or two days without a break is possible. 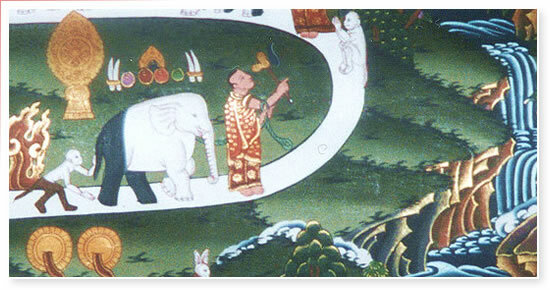 In the drawing the monkey disappears and the elephant becomes completely white. The mind can now remain continually in absorption on the object of concentration. The monk meditates, and the elephant just sleeps. The meditator is totally non-dependent upon the senses and in perfect equanimity. The path has ended and the elephant is at rest. At this stage there is no limit to the length of fixed concentration. According to the meditator's feelings, his mind and the object become one. The ninth stage of samadhi or mental absorption is attained through the power of total habituation, a familiarization and integration in Calm-Abiding. After the 9th Stage of Calm-Abiding is attained, many new and extraordinary experiences come, which have never been experienced before. When these experiences come, this is the sign that Calm-Abiding has been attained. From the heart of the meditating monk emanates a rainbow. The monk is shown flying alone; this is bodily bliss. Riding the elephant is the attainment of Calm-Abiding, across the rainbow is mental bliss. Wielding the flaming sword of perfect insight, the monk returns triumphantly along the rainbow; for samara's root is destroyed in union of samatha and vipasyana (sword), now with emptiness (sunyata) as the object of contemplation. Control of the flame of supreme remembrance and clear comprehension represents the ability to examine the sublime meaning of sunyata: the knowledge of the ultimate reality of all phenomena. From the monk's heart emanate two dark rainbows, which the monk is just about to cut asunder with his flaming sword of wisdom. 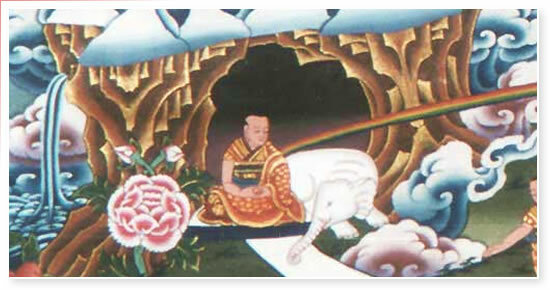 These two rainbows represent karmic hindrances and mental illusion (klesa-varanā), and the obscurations of the instincts of mental distortion (Uneyavarana). Not only when in meditation, but in all actions, the one possessed of accomplished Calm-Abiding is at this stage fully concentrated. The body feels light as the wood-wool flower (like the mimosa blossom). Having achieved this goal, the meditator gains all other supernatural powers (such as reading minds, disappearing, and transferring his consciousness into other beings). Like someone who has "sharpened the axe to cut all things," he is capable of doing any other meditative practice. After sharpening an axe, so a person must use it. Therefore from taming the mind in Calm-Abiding, one must use it for attainment of Illumination! We must ourselves become Buddha! The miracle powers are not important things. The important thing is developing the mind! One has to free one's mind from the "trap of delusion."